Many fans’ hopes were answered as we finally got to see Hank and Karen when they were a strong couple, both eagerly facing the prospect of their new life in L.A. Based on context clues like Becca’s implied young age and the fact that the film in question had wrapped about a year before the first season began, we can assume that we’re seeing the couple about four years prior to the pilot episode. Both are still basking in the warm promise, and it’s heartbreaking to know what’s ahead of them. Hank: Cities don’t change people, people don’t even change people. We are who we are. Luckily, we’re treated to this glimpse into the past as part of Hank’s songwriting process with Kali, an alluring singer he first encountered on a red-eye from JFK to LAX. 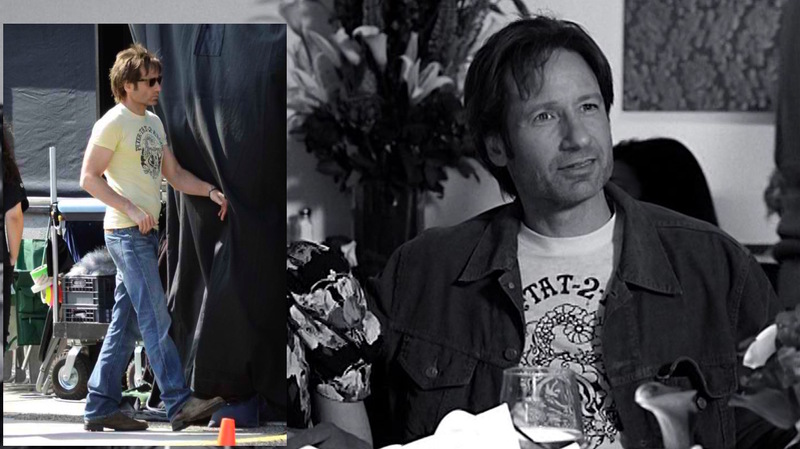 The flashback gives us some cool weekend looks to channel a dressed-down Hank Moody without always resorting to the usual black t-shirt and jeans. 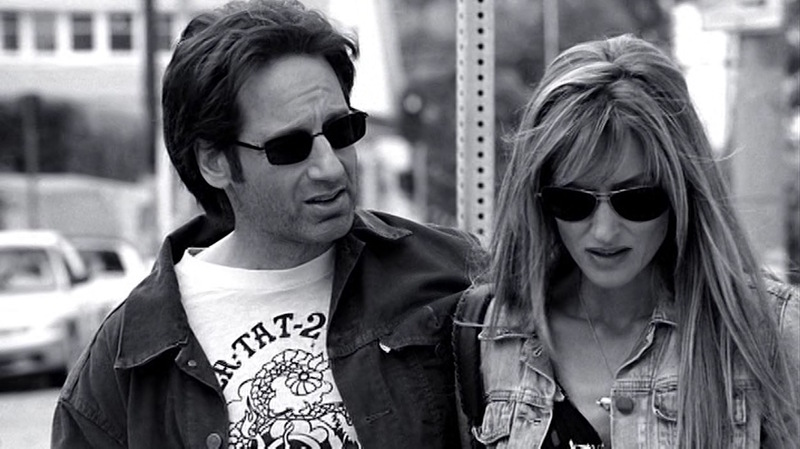 Hank has always been an anachronism – “an analog guy in a digital world” he is called in the first season – so it makes sense that he would still be sporting some grunge-inspired duds by the early 2000s when he and Karen finally make their fateful move to the left coast. Our first look at Hank and Karen at their happiest shows us that he hasn’t strayed far from his original style by the time the show’s storyline begins. Hank strolls with Karen into Venice Beach wearing a brown corduroy jacket, t-shirt, and jeans. The t-shirt is the most un-Moody part of the outfit, as we’re pretty used to seeing solid dark shirts after multiple seasons of the show. In the “Love Song” flashback, Hank wears a cream yellow short-sleeve cotton crew neck t-shirt with the ornate logo for “PETER TAT-2 ASSOC.” printed in black on the front. A Google search reveals that this is most likely from a tattoo parlor in Denver. I had initially run a search in 2011 to find out more, and I was able to secure the art for the logo actually used on the shirt. Four years later, however, it appears that the shop has changed its own art and the logo found on Hank’s t-shirt is no more. 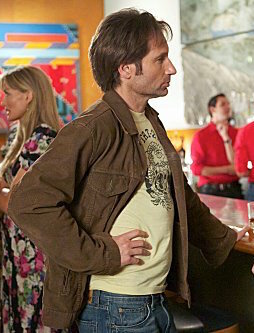 Over the shirt, Hank wears a brown corduroy trucker jacket that appears to be one size too large. The jacket has two patch pockets on the chest that button through pointed flaps as well as two lower welted hand pockets. Hank keeps all six brass-finished metal buttons down the front unbuttoned as well as the single button on each cuff, further emphasizing the length of the oversized jacket’s sleeves. The back is split into three panels, and there is a single 2-button tab on each side of the jacket’s waistline to adjust the fit. The corduroy trucker jacket is likely an original Levi’s model, as the tag on the left pocket would imply. A production photo of Hank and Karen in “Love Song”. An ardent advocate of denim, it’s no surprise to see Hank wearing a pair of medium-blue wash jeans, worn low around his waist, as he walks the streets. Hank’s jeans have a standard five-pocket layout and a tan back patch above the right rear pocket. Hank’s accessories are all his usuals. He wears a pair of tan suede Timberland Torrance slip-on Chelsea boots with black elastic side gussets. His sunglasses are the oft-seen Izod 725 with slim frames and brown lenses. The same simple black leather braid adorns his left wrist… sans the black studded leather bracelet and his silver ring, interestingly enough. Hank’s reliable old Izods in action. Also note the tag on the left pocket of his jacket… possibly Levi’s? 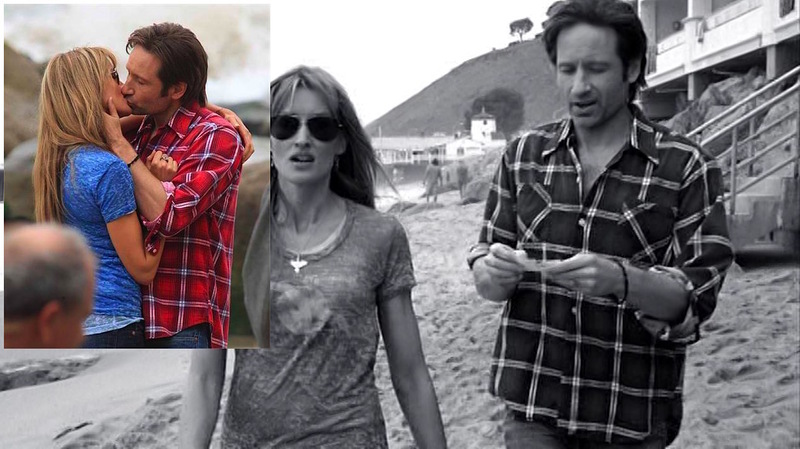 Hank channels his inner grunge fandom as he hits the beach with Karen, wearing yet another surprisingly vibrant shirt (although the grayscale-filmed flashback doesn’t quite make this evident at first). The red lightweight cotton shirt has a large white double-stripe grid check, accented by a navy shadow check. Hank buttons a few of the 7 white plastic buttons down the front. The roomy shirt has a large collar, two patch pockets on the chest, and unbuttoned cuffs that Hank wears rolled up to his elbow. Hank and Karen, on and off camera. For a business meeting to discuss the eventual production of God Hates Us All Crazy Little Thing Called Love, the show nicely nods to Hank’s earlier style by returning the familiar olive brown thin-waled corduroy smoking jacket from the early seasons. This single-breasted 2-button jacket has padded shoulders with roped sleeveheads, single vent, welted breast pocket, flapped hip pockets, and 3-button cuffs. The left lapel of the edge-swollen notch lapels has a buttonhole stitched into it. A behind-the-scenes shot of Dave and Natascha filming on the beach. While the jacket makes a familiar return, the rest of the outfit is all new… and very off-brand for our hero. Hank wears a blue chambray cotton shirt, a fine choice for a newly-ordained beach-dweller, with large white plastic buttons down the edge-stitched front placket and on the square button cuffs. The shirt also has two open patch pockets on the chest. To save the most surprising part of Hank’s attire for last, he actually abstains from wearing his beloved jeans in favor of a pair of flat front khaki chinos! My favorite look from the “Love Song” flashbacks includes the distinctive “PETER TAT-2” shirt under the corded trucker jacket. It is very true to Hank’s character without being as obvious as just another solid t-shirt. It’s also interesting which accessories (the ring, bracelet, etc.) were left out for the “earlier” scenes. Catch up with Hank and the gang by watching the full series of Californication. Many fans (myself included) will argue that the show’s first few years were its best, but this episode was a solid entry from the polarizing fifth season . Come on back to bed. Let’s californicate. Love the brown jacket with the yellow tshirt and jeans. The faded and slightly baggy jeans date it slightly but it’s still a great look, Added to my ever growing pile of inspiration pics. Thanks – glad to hear it, Joe!